One thing I love almost as much as robots and hand crafted stuff is wine. 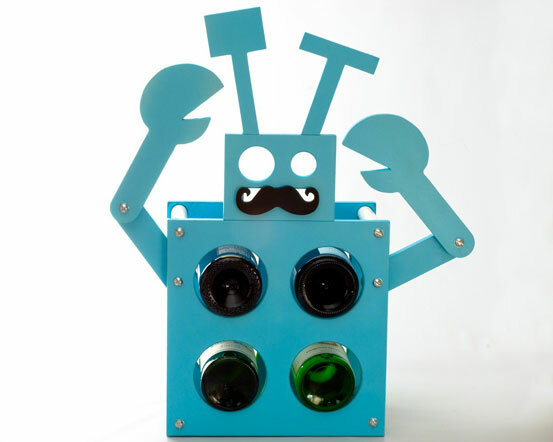 That’s why my inner lush was giddy with delight over this wonderful Robot Wine Rack that I found on Etsy. The wine rack from paperdollwoodshop is made of wood (also a big Chopping Block passion) and painted to bright beautiful blue. Custom colors are available upon request. It has moveable arms and comes with an inexplicable removable mustache. It holds 4 bottles of wine (wine not included) and some light assembly is required. At $39.99 it’s a bit steeper in price than most of the stuff I recommend, but I have a feeling it’s worth it.